Monsters Evil Beings, Mythical Beasts, and All Manner of Imaginary Terrors David D. Gilmore "Gilmore's . . . engaging book suggests a universal need to extend perceptions of evil far beyond the obvious." --Choice The human mind needs monsters. In every culture and in every epoch in human history, from ancient Egypt to modern Hollywood, imaginary beings have haunted dreams and fantasies, provoking in young and old shivers of delight, thrills of terror, and endless fascination. All known folklores brim with visions of looming and ferocious monsters, often in the role as adversaries to great heroes. But while heroes have been closely studied by mythologists, monsters have been neglected, even though they are equally important as pan-human symbols and reveal similar insights into ways the mind works. In Monsters: Evil Beings, Mythical Beasts, and All Manner of Imaginary Terrors, anthropologist David D. Gilmore explores what human traits monsters represent and why they are so ubiquitous in people's imaginations and share so many features across different cultures. 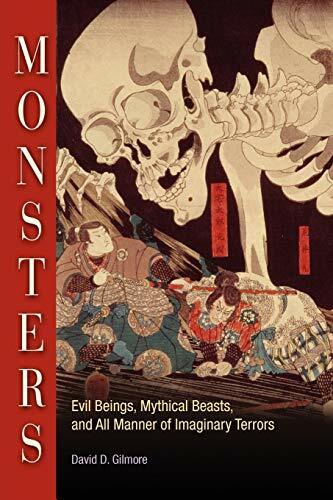 Using colorful and absorbing evidence from virtually all times and places, Monsters is the first attempt by an anthropologist to delve into the mysterious, frightful abyss of mythical beasts and to interpret their role in the psyche and in society. After many hair-raising descriptions of monstrous beings in art, folktales, fantasy, literature, and community ritual, including such avatars as Dracula and Frankenstein, Hollywood ghouls, and extraterrestrials, Gilmore identifies many common denominators and proposes some novel interpretations. Monsters, according to Gilmore, are always enormous, man-eating, gratuitously violent, aggressive, sexually sadistic, and superhuman in power, combining our worst nightmares and our most urgent fantasies. We both abhor and worship our monsters: they are our gods as well as our demons. Gilmore argues that the immortal monster of the mind is a complex creation embodying virtually all of the inner conflicts that make us human. Far from being something alien, nonhuman, and outside us, our monsters are our deepest selves. David D. Gilmore is Professor of Anthropology at the State University of New York, Stony Brook. He is the author of several books, including Misogyny: The Male Malady, also available from the University of Pennsylvania Press. 2002 | 224 pages | 6 x 9 | 30 illus. ISBN 978-0-8122-2088-9 | Paper | $22.50s | £15.00 World Rights | Anthropology, Literature, Cultural Studies Short copy: A field guide to the world's scary creatures, along with an intriguing explanation why monsters won't go away. Gilmore considers the role of monsters in the human psyche and in society, looking at art, folktales, fantasy, literature, and other sources.